Most of you reading this article have likely posted your photos online for others to see and offer comments. 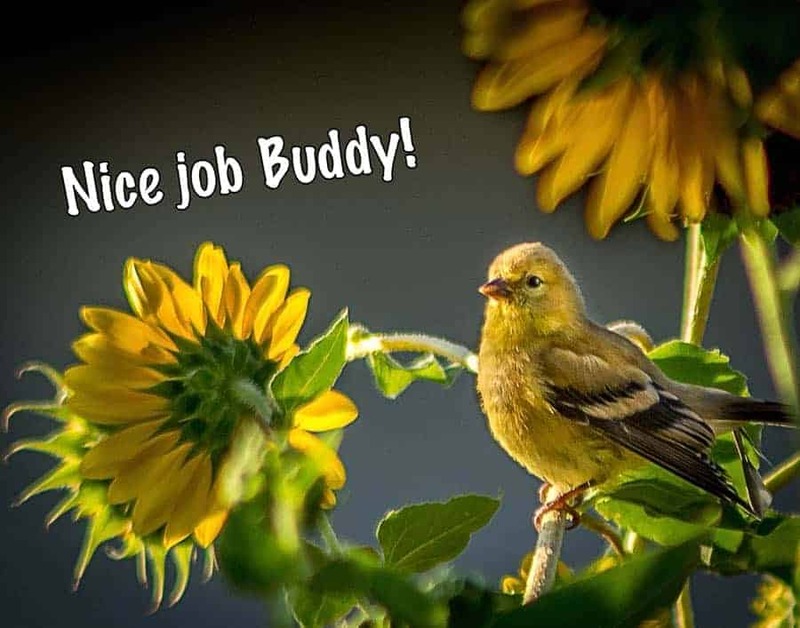 If on Facebook, almost any decent posted image is bound to get a few “Likes.” You might even get a comment or two, something like “Nice Shot!” If all you’re doing is fishing for compliments and some ego stroking, perhaps you’re satisfied with that. On the other hand, if you’re seeking to improve your photography, wouldn’t an honest critique, even one that pointed out some problems with the shot, teach you more? In this article I’d like to offer some reasons you should “seek critique” if your objective is to grow as a photographer. Who can argue that getting a positive response when we show a photo doesn’t feel good? There are many reasons we make photographs, but I’m sure at the top of the list is the ability to create images that communicate our vision and get favorable responses from our viewers. I am not suggesting that you need to get a negative review or harsh criticism of your images to learn anything from a critique. What you should seek however is an honest assessment and “constructive criticism” from someone who is knowledgeable about photography, knows more than you do, and has your best interests at heart. Face it, new photographers make mistakes. 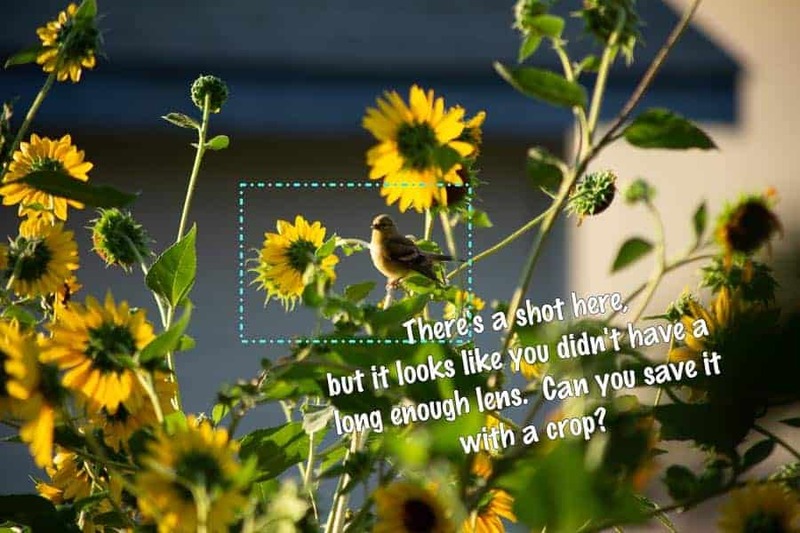 Your composition skills might need work, you may not have mastered the technical aspects of your camera, the exposure might not be right or the focus a bit soft, or perhaps your editing skills are still a bit weak. That’s to be expected, photography isn’t learned quickly. Does that mean you shouldn’t show your work or that if you do, you shouldn’t invite critique of your images? 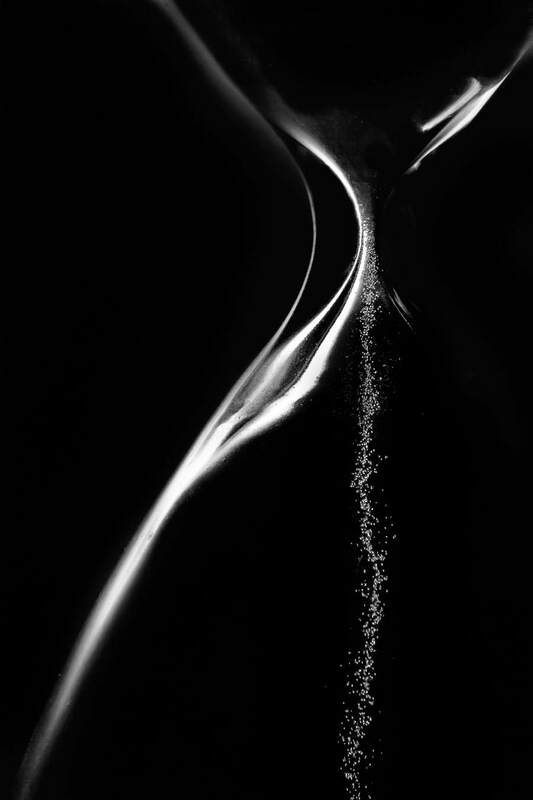 You want to wait until you’re “ready” to subject your photos to critique?” When will that happen? Quite the opposite I’d say. Often as a beginner we often “don’t know what we don’t know” and unless a more skilled photographer points things out, we may not realize where we need to improve. If you are “self-taught” you can only become as good as your “instructor.” If however, you seek out help from more experienced photographers, how much faster will you improve? What if you are a more seasoned photographer, does that mean you no longer need critique of your images? Unless you want to believe that you “know it all” I’d say no, you too can benefit from critique. If nothing else, another photographer may suggest an alternative way you could have approached the shot, perhaps not better, just different, something that may not have occurred to you. It’s easy to get stuck doing things they way we’ve always done them and often a fresh set of eyes can help us out of a rut. I belong to a camera club and every month members are invited to submit images at our Print Night and Projected Image Night for judging and critique. 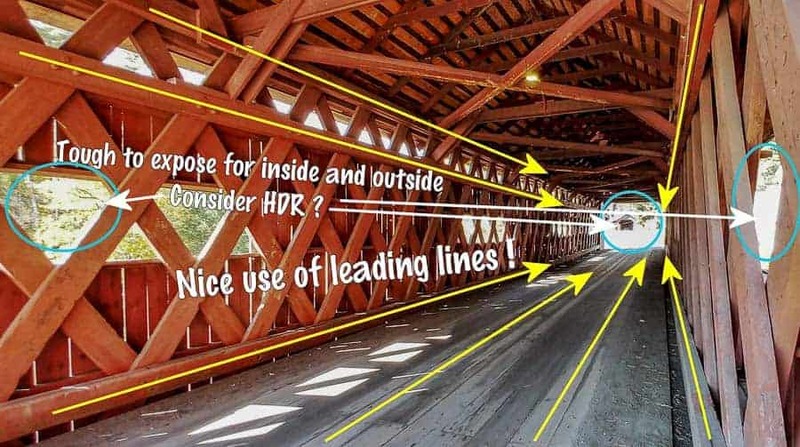 I have seen this more than a time or two – Someone points out something they feel the image maker might have done to make the image better or perhaps something they think the maker should not have done, i.e. “Too saturated” or “I don’t like the heavy HDR look there.” Either way, they have pointed out that the photographers “baby” is not perfect. They may be right or wrong, that’s not the issue. 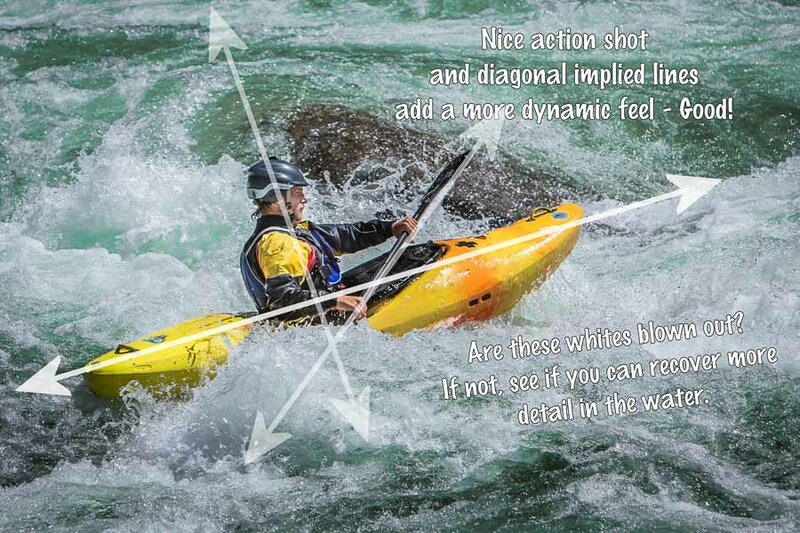 The problem occurs when the photographer’s first instinct is a defensive reaction, mistaking what is a critique offered with the intent to help for an attack of them or their skills. You are not your work. A critique is of your photograph, not of you. I suspect as is the case for all artists, photographers view their images as an extension of themselves, a reflection of their personality, and certainly the works of their minds and hands. It can be hard to separate where “you” leave off and “your photograph” begins. So, when someone points out flaws or work that is somehow lacking, it can be hard not to take it personally. When that happens, take a deep breath and remember – admitting you’ve done something incorrectly is not the same thing as admitting you’re a bad person or a lousy artist. Consider the comments and if you can allow yourself to do so objectively, really listen to what’s being said. You may find you agree with the assessment and if so, the critiquer has done you a favor, teaching you a way to improve. You may think that while the comment is simply the opinion of the critiquer, you disagree and that’s okay, you at least questioned your own work and still feel that what you did is valid. Or, you may vehemently disagree, think the critiquer is a “misguided buffoon”, and their critique is total rubbish and that’s okay too. Just quietly smile and say thank you. Remember, this is about your photo, not about you. Be receptive. Create an open invitation for people to critique your work. All of us in our various walks of life develop a reputation, the opinion of others of what we are like. Know it or not, this extends to the people we associate with in our “photo world.” So, if you begin to show your photos for critique but are always very defensive about critical comments, others will learn that it may not be best to be candid with you, especially if they think your images are weak. You will find that your best friends, the people with who you’re established a relationship of trust with, will be the most honest with you. They will feel it’s ok to perhaps critique your work as they know you will view that as an effort to help you. However, in more casual relationships, people will be reluctant to give you candid comments, especially if you’ve developed a reputation for defensiveness. When other photographers hesitate to critique your work, consider that a bad sign and do a little self-assessment. The objective of submitting your photographs for critique is to learn what you’re doing right and where perhaps you can do better. That is why “Likes”, or “Nice Photo”” comments aren’t worth much, they don’t offer any information for improvement. Make it a practice to seek this information from the critiquer. For example, if they say “I think this image is a bit too flat,” you might say, “Yes, I sometimes struggle with what Lightroom tool to use. What technique would you suggest for this shot?” When you respond like this, you do several things; 1) Compliment the critiquer for their observation, 2) Express interest in hearing about their expertise on the subject, and 3) Open yourself to learning something new. A critique without the follow-up of how to improve is only a comment. A good critiquer usually will have the objective of trying to help the photographer do better, but sometimes it takes some extra work to draw that information out. Or, if that’s not a possibility during the critique, make it a point to later explore how to do better on your own. When we submit an image for critique, the natural tendency is to present our best work. We like praise and so offering our best images is a good way to achieve that, yes? Perhaps so, but as discussed before, is praise what we’re after? What will help us grow most as a photographer? 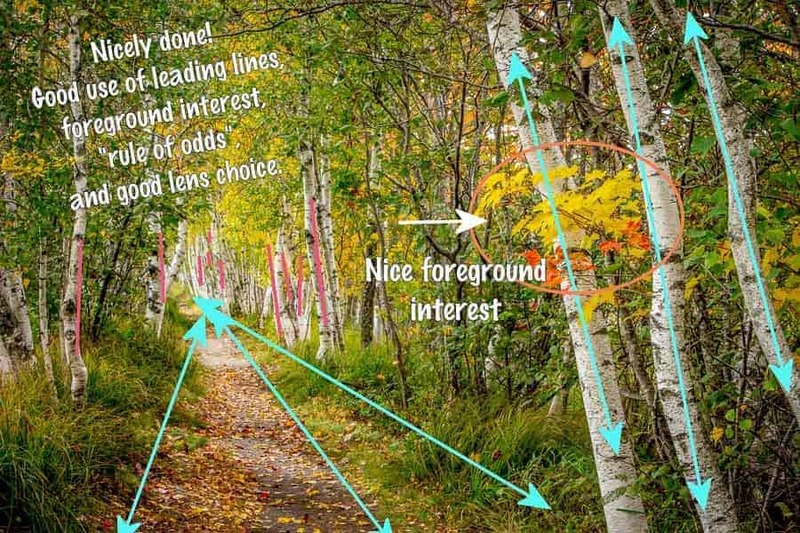 I would suggest that sometimes a good way to learn is to present images that are “almost there” but somehow didn’t achieve exactly what you envisioned. Show images where you struggled with composition, an editing technique, or something else. What you’re after is suggestions on how you can improve. If you couldn’t figure it out, a critique might be a great way to solicit that information from someone else, someone with more knowledge. Another good reason for submitting less than your best shots is that since you already know the photo is lacking in some way, you will be less apt to want to defend it and thus be more receptive to feedback and seeking suggestions on how you might have made it better. Sure, great shots that are “slam-dunk” winners will get praise, perhaps high scores, and make you feel good. 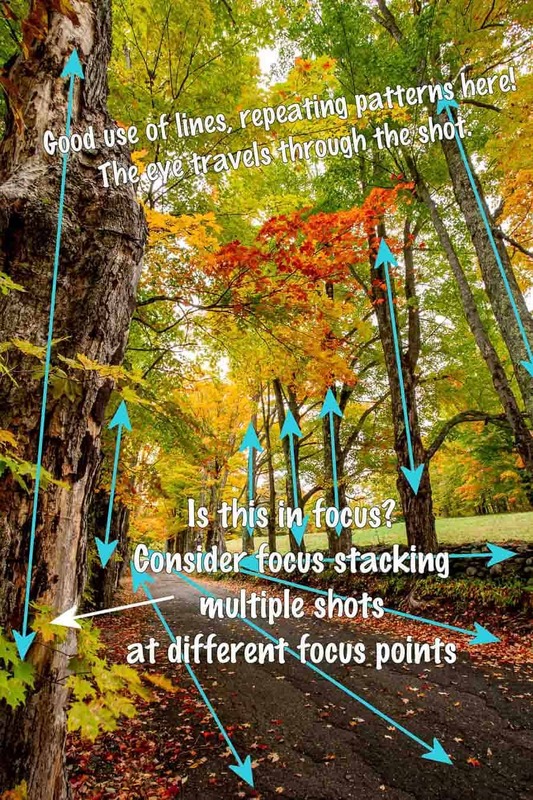 But images that garner suggestions and recommendations on how they can be improved will gain you increased knowledge and grow your photo skills. One “Feels Good”, the other is “Good For You.” Which do you choose? Tap into people's desire to be helpful. Many people love to be problem solvers. I know I’m wired this way – the greatest compliment you can pay me is to ask for my help and advice. People who do this unknowingly communicate to me that they admire my knowledge and trust that I will offer helpful information. If after the interaction they say “thank you, that really helps me” they’ve probably made a friend in me. Some of my greatest satisfaction in photography is helping others learn and grow. I’m sure I’m not alone in this. 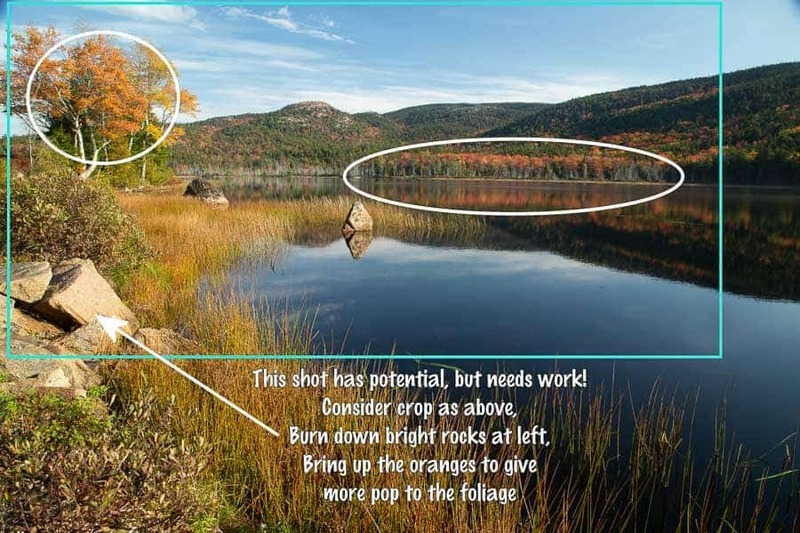 So, tap into that when you seek a critique of your photos. If someone offers an observation, even one that’s critical of your image, ask if they can help you with that. “What would you have done differently?” should be your question. Seek to learn. I mentioned I’m an active member of a camera club, the Boise (Idaho) Camera Club to be specific. I have been a member for many years now and many of my best friends are fellow club members. I participate in their monthly Print and Projected Image Night critiques, have taken many field trips with the group as well as trips with individuals from the group. I did an article, “10 Ways Joining a Camera Club Will Improve Your Photography,” last winter. Read it and you will see an emphasis on the benefits of critiques. You may also note that a “critique” need not always happen of an image itself, but occasionally can happen while out in the field making photos. If a fellow photographer watches you struggling with your composition, a camera control, or other technique, if you’ve established a relationship they may say, “Hey… why don’t you try it like this?” Or, as I suggested above, you could offer them a compliment in the form of, “I’m having a hard time with this shot, what can I do here to make it better?” Either way, you’ll likely do two things, Learn Something, and two, Strengthen Your Friendship with a fellow photographer. Win-Win I’d say! Perhaps there’s not a local camera club where you live or you’d like to tap into the knowledge of a broader base of photographers. That’s when you may want to find online forums where critiques are featured. What you want here is a group where knowledgable photographers visit, offer good, candid, and helpful critiques, and do so in a spirit of helpfulness. You may see people posting images and asking for “CC”, which of course means “Constructive Criticism.” Keep the emphasis on “Constructive.” Occasionally you may encounter a few “trolls,” people who seem to delight in baiting others with harsh, negative, unkind and unhelpful comments. Don’t “feed the trolls” is the best advice here. Don’t engage in a “flame war” with these kinds, they are not there to help you and trying to defend your work is pointless. Instead, be open and receptive to the critiques of those that do want to help and learn what you can. I’m still exploring the online world of critique forums and so if you’ve found some you’d recommend, please post them in the comments section of this article. A good place to start however is simply to Google “Photography Critique Forums.” I noted this search brought up many online articles with reviews of such sites so this could be a good springboard for finding places to post you images for critique. Who makes a good critiquer? When submitting your photo for critique and deciding if the comments offered are worthwhile, the knowledge and skills of the critiquer need to be considered. A good critiquer need not always be a better photographer than you however. Even people with lesser skills may still have good suggestions worth consideration. I think the best critiques come from someone who both offers good observations about your image and, helps you explore questions you may not have thought about when you made the shot. They will explore things like, “How does the photo make you feel?”, “What do you like about the composition and how might you improve it?”, “What inspired you to make this shot?”, “What was your vision here?” “Do you think this photo communicates that?” A good critique should not be a “put down” of your work and make you feel unworthy as a photographer. It should instead encourage you, give you things to work on, energize and empower you to do better with your next shot. When you find a critiquer whose work and opinion you respect and who you know has your best interests at heart, you will have found a treasure. As you should not need to be a trained composer to appreciate a good piece of music, neither should you need to be a skilled photographer to appreciate a good photograph. In fact, too much “head-knowledge” can sometime get in the way. A photograph should “speak” to your viewer in a way that does not need your words to interpret it or knowledge about composition, photo technique, or even an art background. Some of the most insightful observations I’ve gained about my work have come from non-photographers, people who have no more qualifications than liking to look at pictures. On a few occasions I’ve had the opportunity to have my images on display somewhere. I very much enjoy being unknown to the persons looking at my work and simply being a “fly-on-the-wall,” hanging out unobserved but within earshot and listening to their comments. 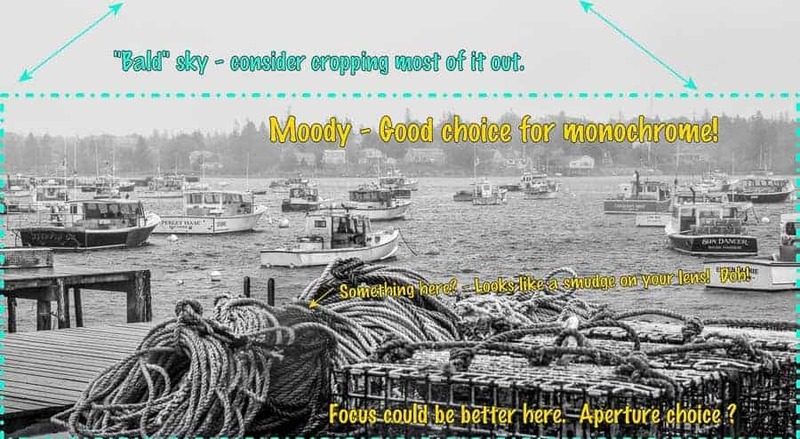 While you won’t have the opportunity to be anonymous, another good exercise is to post an image on social media and asking questions like, “How does this image make you Feel?” What you’re after is how the image reaches people at the “gut level,” does it communicate on its own and if so, what does it say? The worst response you can get is, “I don’t know… I really don’t get anything from it.” If you get too many of those comments, it’s time to work harder to create images that DO communicate your vision. In my last article I wrote about Eight Reasons Photographers Should Own a Chromecast. Reason #2 was – “View Your Own Photos.” Sure, I enjoy seeing my shots again and with a large collection that randomly displays on my Chromecast, it’s a walk down Memory Lane as it will bring up images I haven’t seen in a while. It’s also an opportunity to self-critique my own work. Photos are like any other art form, the best ones will stand the test of time. If after months or years when you see one of your shots and it still speaks to you, that’s a good sign. It’s also a chance to ask yourself, “What about this image is good, what did I do right here? How can I incorporate that success into more of my work?” Of course you should also see images that when they play back your response will be, “Ugh! What was I thinking? I used to think that was a great shot and now that I’ve moved on and learned more I’m actually embarrassed to claim it as mine.” If that happens, that too will be a good thing as it means you’ve learned, grown, and improved as a photographer. Add that knowledge to the “don’t do that anymore” file. 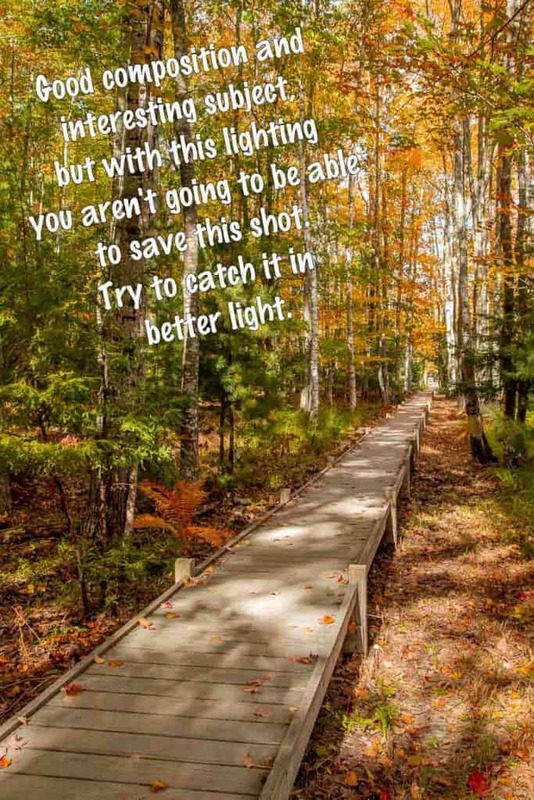 You may also see some of your own images that reflect the trends of the time, the new software you were learning, the flirtation with HDR or some other technique that perhaps you used a little too heavily at first and now have learned to dial back. Again, self-assessment is a good thing. You’re looking at your own “portfolio” and it’s a great way to reflect on where you’ve been and where you’re going as a photographer. When I was in college I enjoyed skiing. I wasn’t a great skier, but good enough to get down the mountain and have fun. My roommate however was an accomplished skier, in fact a ski patrolman who’d been skiing since childhood. Invariably, when we’d go skiing together he’d take me to the top of a Black Diamond run, say let’s go, and schuss off, leaving me to stand there, cuss, and say “What the Heck??!!! You expect me to get down this??!! I’d do it, but not without many falls, much colorful language, and bruises afterward to show for it. However, like the saying “Whatever Doesn’t Kill You Makes You Stronger,” it made me a better skier. I’d suggest you seek a mentor who will do the same for your photography, someone whose skills exceed your own, who has your improvement in mind, but who won’t hesitate to push you. If you make an image that is lacking, expect your mentor to tell you, “That looks like $^/#!” But then also expect them to tell you how to do better, show you some techniques, and take you out again to give it another try. A good photo mentor is very much like a good coach and any athlete looking to excel knows that good coaches don’t coddle you. However, when you do score, when you do produce a great photo, maybe win an award or get a perfect score from the judges, you want a photo mentor who will celebrate that Win with you, happy they were able to be a factor in growing your photo skills. 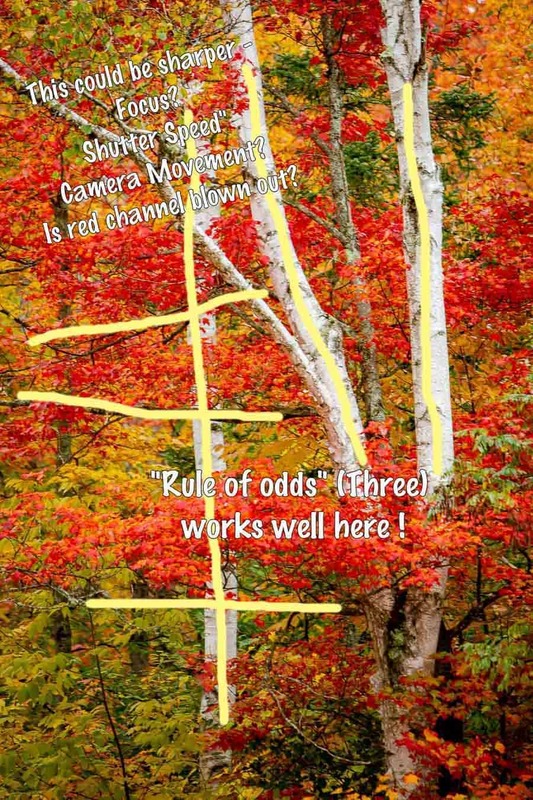 Many of us when making photos, especially new photographers, are seeking to “do it right,” to “follow the rules of composition,” to “get it right in the camera,” to produce the safe, predictable, and “pretty” photos we know will score well and get good critiques. Rather than take chances with photos that may express our personal vision yet break away from established norms, we stick with what is safe. Perhaps when you are still learning and making many mistakes, that’s a good place to be. You’ll endure many critiques that point out your flaws and you’ll need to work on the basics. 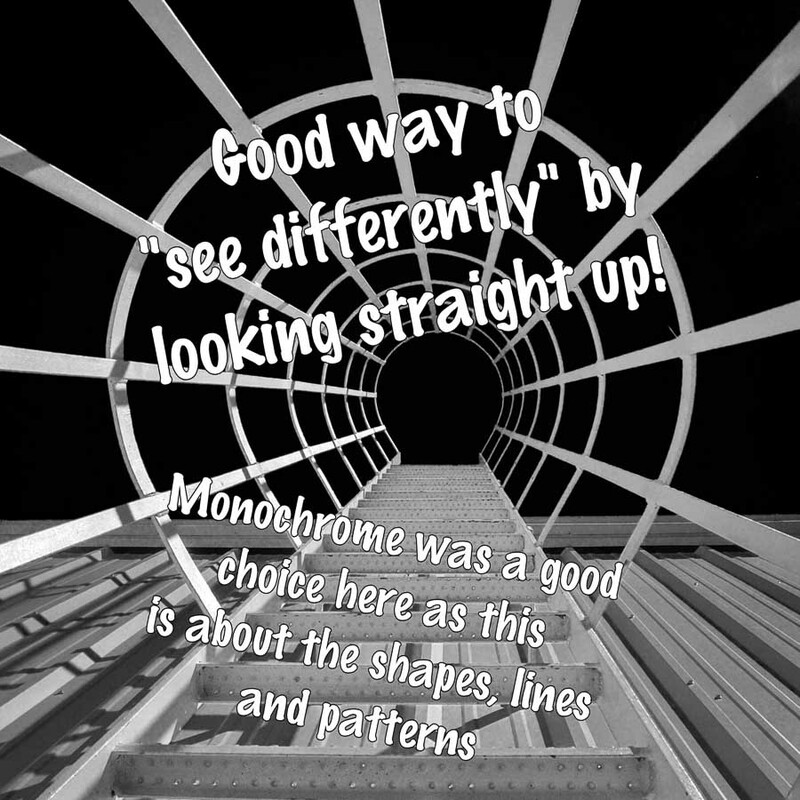 As time goes on however, you may want to explore some unique styles of you own, to go on to “color outside the lines.” Yeah, when you do so you will run the risk of a negative critique by someone who just doesn’t “get it,” someone who doesn’t share or understand your personal vision. When that happens, you will need to do some introspection. If the critiquer doesn’t grasp what you were trying to accomplish is it because you didn’t do it well? Did you try something new but fell short? 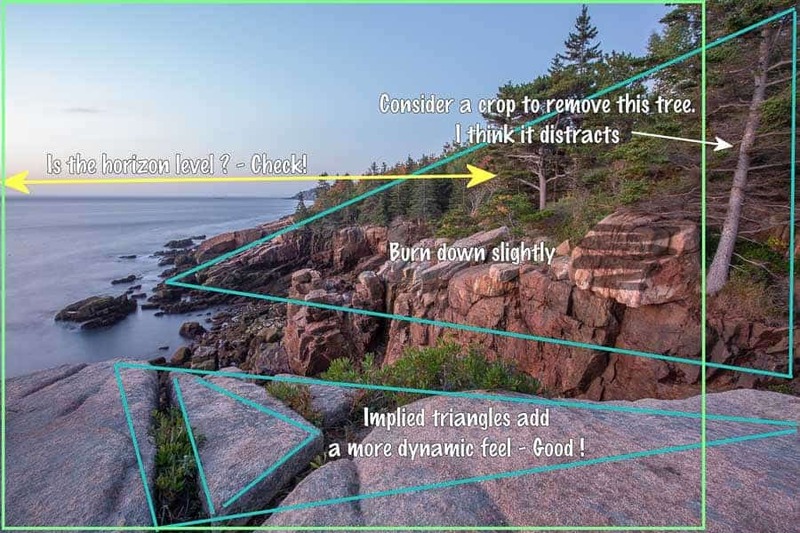 Were you enamored by a new filter, effect, or technique but took it over the top, adding “too much salt” to use the cooking analogy I wrote about in my article, “Don’t Over-Process Your Photo! – 10 Things to Avoid.” Or, is the look you’re creating simply outside the norm, something beyond the standard fare most critiquers are used to seeing and they just don’t get it. That will be something you’ll need to access. Ask I’ve discussed, always be open to critique, even when you might disagree. You might have done it right and the critiquer simply has a different opinion. Then, if you’ve purposely, intentionally, and with proper application of skills created an image you truly believe is good, don’t worry about a contrary opinion, stick to your guns. Remember, many of the best artists and photographers were those who blazed new territory, created looks their peers weren’t used to seeing, who tried new things, even if they weren’t initially popular. In many cases, fame doesn’t come by being “one of the crowd.” Learn the basics and master them, but then carve out your own niche. Often if you want to achieve greatness you need to stop asking for permission. Do in your heart what you feel to be right – for you'll be criticized anyway. You'll be damned if you do, and damned if you don't.” – Eleanor Roosevelt. 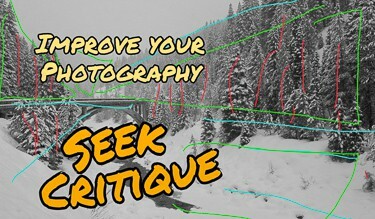 So to wrap up, make it part of your quest to improve your photography seeking critique of your work. If you are personally skilled, perhaps you can critique the work of other photographers. There will always be those who aren’t as skilled as you and those who are more skilled. Teach the former, learn from the latter, and everyone benefits. “The final proof of greatness lies in being able to endure criticism without resentment.” – Elbert Hubbard.